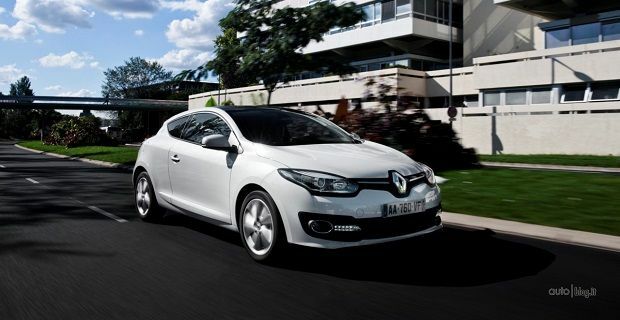 Renault has face-lifted the Megane for 2014 adding new specs and lowering the price. Renault showed the new look machine at the 2013 Frankfurt Motor Show in September but it's not been on sale until this month. The new machine gets a more prominent front grille and a revised bumper. New headlights and running lights complete the revisions at the front. The new looks aren't as impressive as the price cuts that can amount to £1,200. There are five trim levels: Expression+, Knight Edition, GT-Line TomTom, Renaultsport and Dynamique TomTom. There's no shift in the base price, as the five-door hatchback entry-point machine is £16,745. You'll need another £900 for the three-door model and £1,000 more than the basic Megane for the Megane Sport Tourer estate version. The £1,200 saving comes when you purchase the Megane with the 110bhp and 130bhp diesel power plants, but there are other reductions as the 110bhp diesel powered Auto EDC machine is £850 cheaper and the 115bhp petrol has been reduced by £275. There's more equipment in the 2014 Renault Megane than ever before. Auto climate control is now standard on Dynamique TomTom models and LED running lights are part of the package on Expression + models and other higher spec versions. The firm's built in multimedia R-Link system that allows for cloud storage and internet access is now an option on the GT Line TomTom and is standard fit for all coupe-convertible Meganes. The revisions to the engine line-up mean that the 90bhp diesel and the 165bhp petrol engines are no longer sold. Other revisions to the line-up mean that the basic 115bhp petrol engine can be bought on Expression + versions, and the 130bhp petrol and 110bhp diesel power plants are now available with the GT-Line TomTom machines. The convertible version of the Renault Megane goes on sale in January after its unveiling at next month's Brussels Motor Show but all other models can be ordered now for delivery in January.